The latest and greatest technologies bring the promise of a greater, deeper, richer brand connection and the opportunity for rewarding experiences and engagement. In today’s fast-paced, technology-driven tradeshow and event landscape, the possibilities seem endless. For even the most sophisticated and seasoned professionals, the question remains: Where do I begin? Enter 2020 Exhibits High Tech High Touch Interactive Multimedia Expo where over 100 of Houston’s best and brightest event and tradeshow marketers from 55 companies joined 2020 Exhibits to find out. Gathering in our 15,000 square foot interactive technology and exhibit design showroom in Houston, these pros gathered to test-drive the latest and greatest event and tradeshow technologies. From touch screen technologies to live social feeds, video, 3D, custom gaming, micro-sites, event apps and the latest in cloud-based project, event and lead measurement technology, visitors were immersed in the experience, going well beyond the more traditional points of interaction. In comfortable, open house environment visitors were able to design and drive their personal experience, stopping to learn more about each technology and engagement solution at their own pace—much like walking the tradeshow floor. With needs and objectives ranging from increased lead strategy, capture and CRM systems integration to interactive, touch screen tables, there was something for everyone. If tracking and managing events and 24/7 collaboration, anytime from anywhere, were the mission, visitors could dive deep and spend time experiencing the many benefits found through Media Station’s interactive, real-time event analytics. 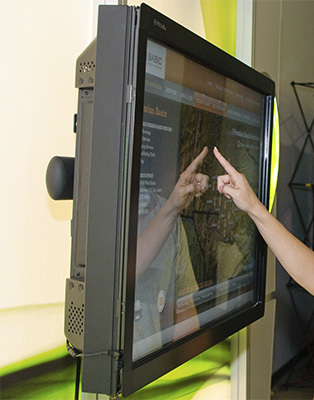 Like bees to honey, the 2020 Exhibits SmartTouch interactive table drew a crowd, engaged and excited they watched images “thrown” up on to the corresponding video wall, in real-time. With a decidedly “cool” factor, many could see the possibilities found in 2020 Exhibits SmartTouch interactive table, from one-on-one engagement or a group presentation from their tradeshow exhibit to an interactive, engaging way to share the company’s story from the comfort of a corporate lobby or conference space. SmartTouch allows for small groups to interact with your brand, together or independently, depending upon the overall objective. Technology has forever changed the way business may operate, but the one thing that hasn’t changed is the power of face-to-face communication. As a global leader in the design and production of exhibits, events and environments, we know that attention grabbing; awe-inspiring events and experiences aren’t limited to the trade show floor. From compelling, inspiring and brand-infused exhibits, events and environments, to powerful interactive multimedia, and beyond – 2020 Exhibits delivers the total event experience for brands worldwide. Let’s get started!